[This is a work in progress, to be added to and amended whenever I feel sufficiently clear headed to address the subject appropriately]. This next is the preliminary thesis, which can also serve by way of an Abstract, or brief synopsis, so that anyone who wishes can read it, and quickly decide whether to dismiss the whole matter and close the page, or press ahead and plunge into the details. For the past decade, nearly 4,100 endangered sea turtles — over one every day — have been sucked into the St. Lucie Nuclear Power Plant on Hutchinson Island, near Port St. Lucie, Florida. Nearly one-tenth of the marine animals are injured or killed. The report above is our global catastrophe summed up, in a nutshell. The technosphere – that is, all the artificial manmade systems and devices that we have created, more or less a synonym for industrial civilisation, our towns, cities, roads, plus agriculture – devours and destroys the biosphere. The biosphere being the natural world that existed in a pristine condition, prior to noticeable human impacts, the ‘thing’ that has existed for the past several billion years, that ‘thing’, some call nature, perhaps with a capital Nature, which produced us. Humans – other than a tiny insignificant minority – do not understand this. They do not understand that the technosphere is destroying the biosphere, and that the biosphere is collapsing and this means the result is a mass extinction event. Most humans want the technosphere. They do not understand or realise that the technosphere is not self-sustaining, that it cannot maintain itself, it only exists by eating up and polluting the biosphere. When the biosphere finally collapses, that is also the end of the technosphere. The biosphere was a self-sustaining system, which had achieved an equilibrium, where there was a measure of stability, so that when perturbations occurred, life could compensate. We see this, in the geological record, from the previous mass extinction events, some of which have been very severe. Eventually, after several million years, life rebounded, new species evolved. There have been constant fluctuations, the planet has never been perfectly stable, if life could not cope and adjust, then we would not be here, none of the species would have survived, resilience is obviously part of the system. Some 90% or so of species are NOT here, they vanished. And one of the causes for a massive loss of species, is the rate, the speed, of change. And, from what some of the scientists are saying, the changes that WE are causing NOW, just in recent decades, are the fastest in the whole geological history of the Earth, barring impacts from massive projectiles from Space. So ponder that. There is no time for adaptation to occur, when many biological organisms and systems require centuries and millennia to evolve. I think – this is my speculation, looking at the geological history, and the small amount of work that has been done – nobody seems very interested – that all life forms are connected, via information. I will try to research and develop this, from the sources that I have, below. Information needs to be defined here in a rigorous sense, which I cannot do in a short comment. But the entire system keeps itself viable, by distributed information, so that life clings on. To the rather hostile lump of rock hurtling through Space. Humans are ignoring this system in an utterly reckless fashion, and we are in the mass extinction event which cannot be reversed, the forces involved are way beyond anything we can control, even if we understood them well enough to know how to foresee the results. This process is just going to run its course. We will have to watch as the wonderful Earth we inherited a few thousand years ago gets turned into something resembling Mars. People will shriek in horror and despair, that is understandable. Or just turn away and disregard the ideas, because they are too troubling. But I do not see any means of changing this trajectory that we are on. So that is the end of the introduction. Here is an image which again shows our situation summed up in a nutshell. Cute, isn’t it ? The road, the crash barrier, the car, the officer with his uniform and equipment, all that is technosphere. 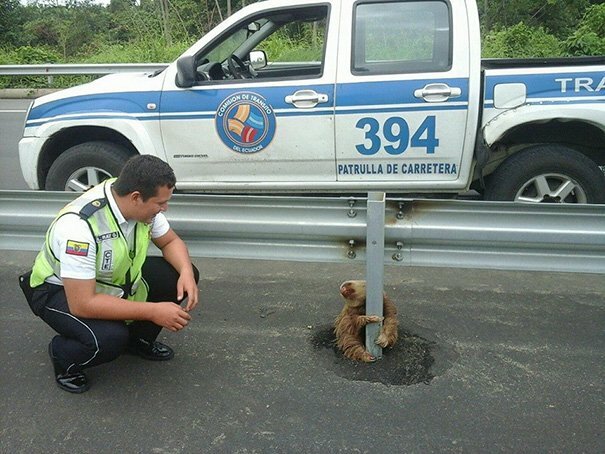 The sad lost sloth, trying to cross from the trees and vegetation, is stranded and confused, and needs to be rescued and returned to the biosphere, of which it is a natural part. I am not going to mention global warming or climate change in my argument. Obviously, if we get the minimum expected rise, of 1.5 C deg. then that will have fairly dramatic consequences, and if we get the upper end predictions, of 6 deg or even more, then we will not survive at all, the idea that we can or will is an idea for fantasists who have no real experience of surviving outside of offices and bedrooms, and no clue about climate. “These are now the highest atmospheric CO2 levels seen in the last 23 million years. And an annual rate of CO2 increase approaching 4 parts per million is unheard of for any time period in any geological record — even during the Permian hothouse extinction event which wiped out about 90 percent of life in the oceans and 75 percent of life on land. This very rapid rate of atmospheric CO2 increase is being spurred on by a fossil fuel based carbon emission now in the range of 13 billion tons each year (of which CO2 is the vast majority). That’s a rate of carbon addition more than ten times faster than the carbon spike that set off the Paleocene-Eocene hothouse mass extinction about 55 million years ago. If you want to know why we become extinct because of climate change, then read Guy McPherson’s Climate Summary page. In my estimation, we have not yet felt any really powerful impacts from global warming yet, as far as extinctions are concerned. The average global temperature has increased, and the temperature in the Arctic north has increased very noticeably, weather patterns have altered, glaciers melt, etc, etc, but the really dramatic stuff is all to be expected oncoming in the future. That’s why the people who understand the climate science are so freaked out. But, as I said, I am leaving all of that aside. Because we STILL are in a mass extinction event, regardless of any climate change or global warming, aren’t we ? People do not seem to be aware of this. That’s my impression. Even with no climate problems, we would still be in a major global disaster. You think any politician who says, ‘Look, we have to close down civilisation, go back to living in the ancient ways, no more electricity or plastic, it’s not compatible with a viable planet, no more planes or cars’ will be elected ? Not only not elected, they will probably be forcibly detained and treated against their will by psychiatrists, or imprisoned for endangering public welfare or something. Those kind of ideas are outside the scope of the paradigm of reality the majority inhabit. Civilisation IS, the technosphere. People want their electricity, so they want their nuclear power plants, and – although they may be sad about the endangered turtles, and regret that they are killed and injured – most people do not think about it, and do not care, they think it’s someone else’s problem. Animal welfare people or someone. Nobody takes moral responsibility, themselves, for the planet, or the biosphere, they simply do not comprehend the issues. They think that technology and money and a nice standard of living, are what matters, and what they are entitled to desire, aspire to, and expect. Do you think that is going to change ? Of course not. Even if you could educate a couple of billion, in the available time frame – which is already gone – human nature is not going to change, is it. It was much the same two hundred years ago, as it is now. People go for fashion, shiny toys, nice places to be, social status, etc, etc, It was much the same in ancient Rome, really. So, what happens ? The planet gets covered with tarmac and concrete and the sky is full of planes, and the factories pour out every kind of toxic crap imaginable into the environment, wrecking the biosphere. Wealthy people move to nice secure green areas, and the poor people have to endure the sacrifice zones, where their children breath the foul fumes and the police and ambulance sirens howl all night. An interlocutor might ask me, why it matters if all the sea turtles die, I mean, it might be sad, because they seem sweet and harmless, but why do we go extinct because of that ? There were mammoths, just twelve or so thousand years ago, many other interesting species that have vanished, nobody notices, the biosphere did not collapse. Well, it’s a good point. I think we have to begin from biology, which is the science of life and living things, because that’s what we are talking about. And the folk who disagree with me or dismiss the arguments typically don’t know any biology, they begin from their own notion of what they perceive as their common or uncommon sense, or from politics, or religion, economics, physics, or some other aspect of human affairs. None of those other angles gets the insight that we need here. This planet is a ball of rock, surrounded by a veil of gases, hurtling through Space, as it rotates and spins and circles around the Sun. On the surface of the rock, and in the water of the rivers, lakes and oceans, are all the living organisms. That’s the stuff we are talking about. That’s the particular domain of concern. It’s a relatively small and limited area of study, in one sense. So, if you are talking about losing species, like the turtles, then it’s kind of like losing a rivet from a plane. You can lose one. It does not matter at all. It is not going to bother anybody, except possibly a maintenance engineer. But, how many can you afford to lose ? That’s the question. At some point, a panel tears off and the plane crashes out of the sky. Nobody knows the answer to this question. We are performing the experiment in real time. Every species has interrelationships with others. For most species, these are unknown, and not studied. We do not even know how many species there are. Even quite large new ones, mammals, reptiles, fish, are sometimes found, and as for the small micro organisms and what’s in the deep oceans, it’s just guessing. But there are vital relationships, as we know, from the bees that pollinate food plants. So, you can imagine, take more and more species away, and eventually, you end up with an impoverished desertified landscape, akin to Mars. And then think of going in the opposite direction, build up a very rich ecosystem, with very many niches, which can accommodate a very large number of species. As I understand it, this latter takes a long time. And the point is, that the total biosphere, the only place in the Universe where we humans can survive, because it is the place where we evolved, it’s the place that produced us, this biosphere, is the PRODUCT of all the ecosystems, on Earth, combined, all functioning together. They are what makes the place a viable unit for life. Does that make sense ? Does that sound logical ? It is rather like a huge jigsaw picture, and each jigsaw piece is a local place where there is the local ecology that makes the most of that area, for the living things that can thrive under the local conditions, whether it is is very dry mountain valley, marshes, or a river delta, or a steppe plain, or coral island or whatever it happens to be. So, if the technosphere, the manmade system, comes along, deletes jigsaw pieces one by one, destroying the local ecology, which is what has been happening at an ever increasing, now exponential, rate… well, the total overall picture that you wanted and once had, is gone and cannot be retrieved. You see, a natural meadowland, that occurs on limestone, because the soil is thin and will not support forest trees, is a part of the natural biosphere. It evolves its own special ecology that harmonises with everything else, over millennia. But when humans come along, trash everything, put down concrete and tarmac, put in drainage and irrigation, streetlights, roads, airports, etc, etc, none of this harmonises with anything, it disrupts and devastates the natural system. People try, in recent years, to ameliorate the impact, and so forth, but basically, what nature wants and what humans want are not compatible aims. And building a marvellous brilliantly engineered hi tech eco friendly office or factory out of recycled cardboard, in say, Denmark, does nothing to deal with the massive devastation of the Phillipines, Pakistan, Indonesia, Venezuala, etc, where people are forced to eat and burn whatever they can scavenge, because the rich countries wreck their economies, so that a few fat old men can by squillionairres and live in fortified compounds in Switzerland. This, is what I mean, by the mass extinction event. The atmosphere, the balance of gases that we have, is produced by the living things, the plants and phytoplankton. When the whole system crashes, we get dead, toxic oceans, which give off poisonous gases. It takes hundreds of thousands or millions of years for the balance to be restored and for life to recover. This is the direction that we are going in. We can look at what happened on the earlier occasions, to see what followed. Here’s a snippet. Rieppel is part of an international team of scientists that worked on the study, which has been published in the journal Scientific Reports. Ah, snails. They’re small. They’re slimy. They lack the charisma of a polar bear or a gorilla. And yet just like flora and fauna all over the world, they’re disappearing. At least 17 animal species have already died out in the 21st century, with all but two of these extinctions taking place outside of the US. It comes after an initial report into the state of the country’s wildlife was published three years ago. The new document is expected to provide an update as well as further information following an assessment into the status of 4,000 species. Richard Gregory, the Royal Society for the Protection of Birds’s head of species monitoring, who is leading the project, told The Sunday Times the biggest threat “by far” was the “steady intensification of farming, which leaves no room for wildlife and is driving many species towards extinction”. But today’s “sixth extinction” is unique in the way that the largest species, such as great white sharks, blue whales and southern bluefin tuna, are being pushed to the brink, due to humans’ tendency to fish for larger species more often than smaller ones. The consequences, according to a study published in the journal Science on Wednesday, are devastating for the ecology of the world’s oceans. For example, the Asian two-horned rhinoceros once ranged widely across Southeast Asia and Indochina. Today it survives only in tiny pockets comprising perhaps 3 per cent of its original geographic range. Three-quarters of the world’s largest carnivores, including big cats, bears, otters and wolves, are declining in numbers. Half of these species have lost at least 50 per cent of their former range. WWF’s 2016 Living Planet Report summarises long-term trends in over 14,000 populations of more than 3,700 vertebrate species. Its conclusion: in just the last four decades, the population sizes of monitored mammals, birds, fish, amphibians and reptiles have declined by an average of 58 per cent worldwide.